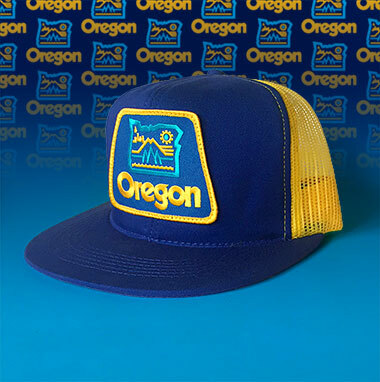 We’ve sold a shitwhack of our “Oregon Oh Yeah” torso covers over the years, and here’s the first hat version! Blue and yellow, inspired by a patch we got in 1993, when we moved here. Be sure to check the stickers out, too! And our monster “Oregon, Oh Yeah” poster, too!